NZ-made and Korean-inspired Kimchi. 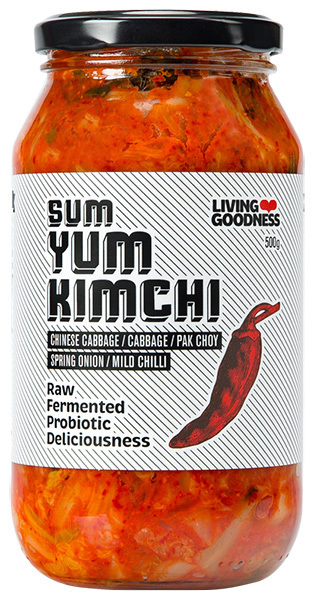 Our Living Goodness Sum Yum Kimchi includes fermented Chinese cabbage, pak choy and spring onions, resulting in maximum raw deliciousness. Fermented Chinese cabbage, green cabbage, pak choy and spring onions mixed up for maximum deliciousness. Using a Korean recipe so secret it has been whispered down from generation to generation... until a Kiwi stole it and started making it in Titirangi! This is a jar or the authentic good stuff it will make your tummy tingle and your taste buds buzz. Serving Suggestion: Sum Yum Kimchi is the ultimate condiment for any meal. Our taste testers recommend enjoying this fermented food with Mexican and Asian cuisine, or any rich dish that needs a tangy dose of goodness. Grab Sum Yum for your tum!